Located at 41st St. and International Ave., in the heart of Oakland ’s Fruitvale district, the “Peace and Dignity” mural spans almost two entire city blocks, making it one of CRP’s most ambitious to date. Conceived by CRP’s Desi W.O.M.E. 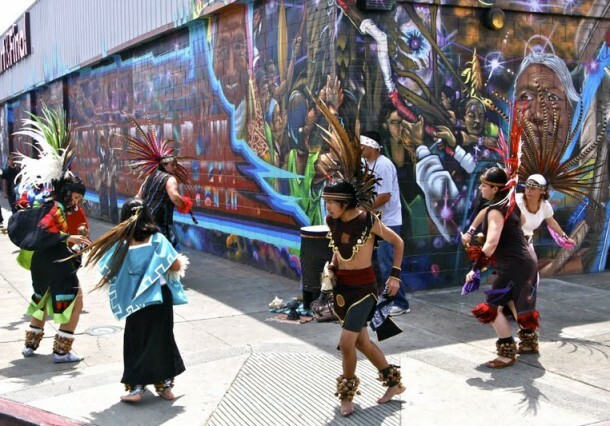 and Mike 360, along with graffiti legends Phase 2 and Vulcan, and painted by Desi, Mike 360, Vulcan, Elijah Pfotenhauer, Pancho Pescador, Beats737, Abakus, Dora Chavarria and youth from the Fruitvale. Commissioned by the property owner Smart & Final and sponsored in part by Oakland’s Community Economic Development Agency (CEDA), the project took more than three months to complete. The mural features vibrantly-painted foreground characters representing indigenous peoples and native symbology: tribal elders, musicians, runners, the agave plant, a hummingbird. Subtle background calligraphy spell out the words “peace” and “dignity” – a reference to the sacred Peace and Dignity Journeys from Alaska to Panama which happen every four years.